I do enjoy my crisscrossing of Bangkok on foot, listening to some of Miles jazzy compositions, on the search for exciting food and new vendors. Sometimes I end up with old favorites, sometimes I discover something new and original. Leung Pha and their pad thai is an old friend and I head for a plate here a couple of times a year. 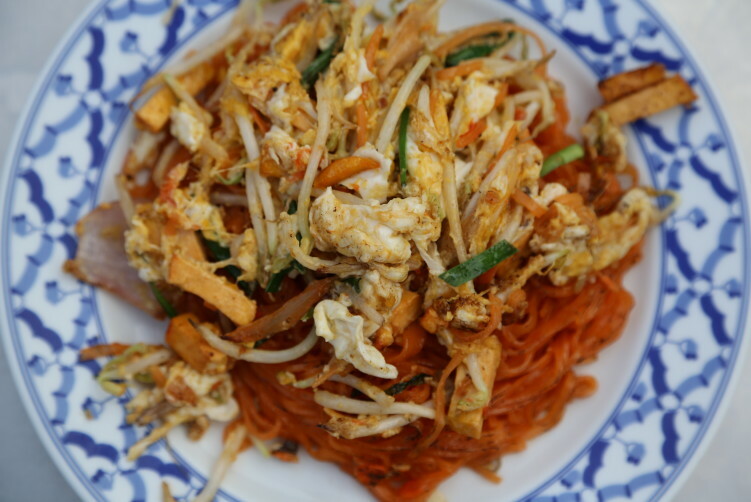 They serve one of Bangkok’s best pad thai, and even better, they have always been consistent. No negative surprises, just lovely pad thai with delicious fat from shrimps head. Unless the rain is threatening the area I prefer sitting outside. But what I sometimes find a bit funny sitting here, waiting for my plate, is the cuing next door at Thip Samai. Nothing wrong with Thip Samai, they shuffle out one of the cities better plates of pad thai. But that said, I find Leung Pha Pad Thai a notch better. The reason is more shrimp fat and smaller batches when making it. And they fire up the real thing, charcoal and not gas. Even Thai’s, coming from the other side of the city, are cuing up in front of Thip Samai while there is empty seats next door at Lueng Pha. I guess that’s what fame brings out. Personally I prefer not to cue, especially when the food is even better. Leung Pha Pad Thai also have a much more relaxing atmosphere. Be aware that the orange juice sold at Thip Samai can be brought to Leung Pha, and you can skip the cue when buying it. So, in case you didn’t already new, orange juice and pad thai is a fantastic combo. The one sold outside Thip Samai is probably the best orange juice I’ve ever tasted, no matter where in the world I have been, and I presume it explains the 150 Bath for half a liter. If on a budget, by some juice at 7/11 across the street. But it’s considered close to a crime not to try orange juice when you’re inn for a good plate like here. Anyway, back to Lueng Pha and their Pad Thai. The orange, almost red, color on the noodles is explained by an elixir named shrimp fat. They have cooked the heads and shells to get the fat out. Absolutely delicious stuff, so don’t wrinkle you’re nose, just dig inn. Normally I go for tofu, as shown on the pick, but sometimes I choose the shrimp version. You can have it wrapped in an omelet or with the egg the standard way. I never choose the omelet version as it will work as a steamer until you cut it open. And that steaming effect has impact on the texture of the noodles. They have options without shrimp fat as well, but I always end up with the orange version. It has an intense shrimpy flavor, making your taste buds as happy as they possible can be. Pickled bamboo shoot, bean sprouts, chilies, spring onion and lime will be put on your table. Most people have their own preferences on how much to add. If you don’t know start with little and work your way until the balance suites you. 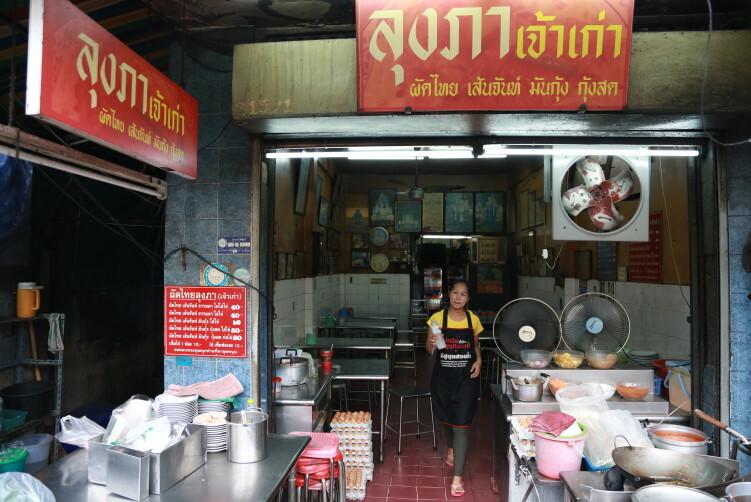 Just don’t pass on this vendor, it really is one of Bangkok’s best pad thai. Leung Pha Pad Thai is a family-run resto and they only serve pad thai. More importantly, they have been doing that for 40 years. That’s a long time to practice for perfection. They have a handout for foreigners, so English shouldn’t be a problem. The ambience is a bit of a step back in time, which I like. The wait will be like 10 minutes from ordering. If you’re still hungry after the first plate, you have another famous vendor just 70 meters down the road, Jay Fai where the Ferraris and Bentleys sometimes park outside to get a fix. If triggered, make sure you have filled you’re pockets with Bath before you come here. Everything is between 400 to 800+ Bath. And if you’re in for more pad thai, why not try Thip Samai as well. 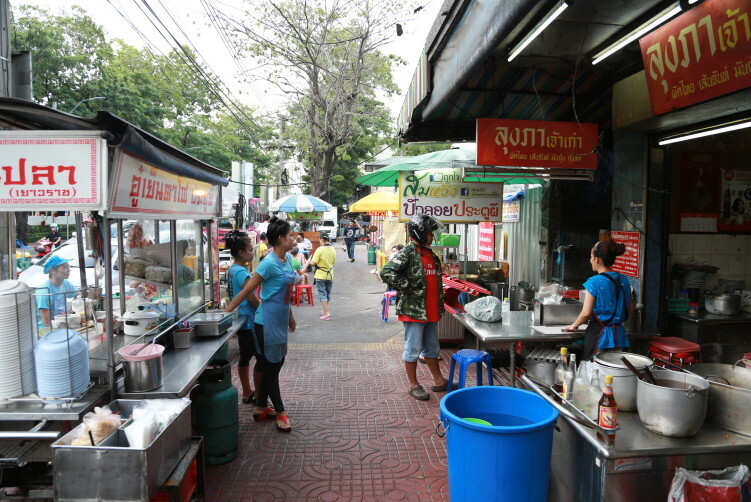 Other great vendors for pad thai in Bangkok is Pad Thai Fire Look in Sukhumvit 38 and Orawan in the Sri Yan area, in adition to Krua Apsorn in Dinso Road. viagra without prescription usa Food: Pad Thai. click here Price: B45 for standard version with tofu. The version with shrimp and shrimp fat wrapped in an omelete (pad thai sen chan mun goong) is B80. Most options between 40 and 80-Bath. Extra egg is B10. How to get there: It’s located in the old district of Phra Nakorn, just a few minutes walk from the Giant Red Swing near Chinatown Bangkok, and very close to the Golden Mountain. 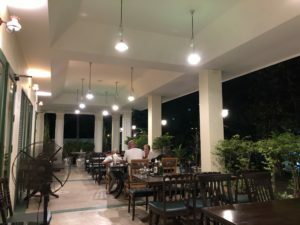 You can take the Khlong Saen Saep canal boat to the final Panfa Leelard station, exit towards Ratchadamnoen, make a left on Maha chai, and the restaurant will be on your left hand side. Alternatively, you can either take a taxi directly there or a bus. It’s also an easy 5 minute walk from Democracy Monument. 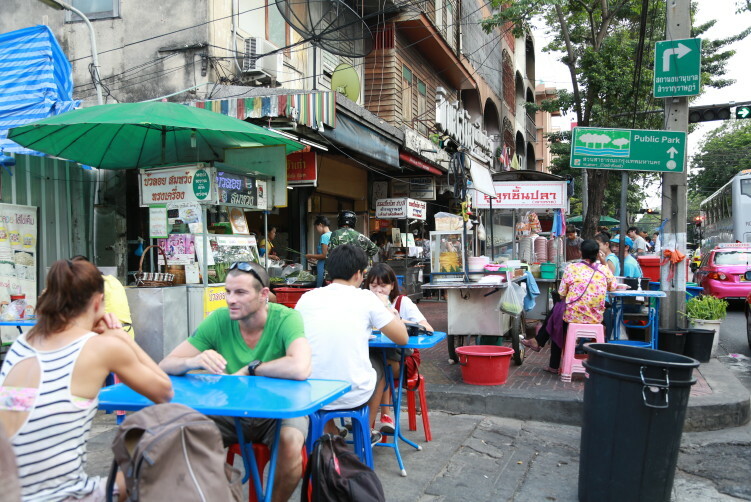 Khao San Road is 10 minutes away. Leung Pha Pad Thai serve one of Bangkok's absolute best plates of pad thai, and even better, they have always been consistent. No negative surprises, just lovely pad thai with delicious fat from shrimps head. See full review at StreetsideBangkok. Meaning Temple of the Royal Niece, the temple was built on request by King Nangklao (Rama III) for the princess granddaughter, Somanass Waddhanawathy, in 1846. 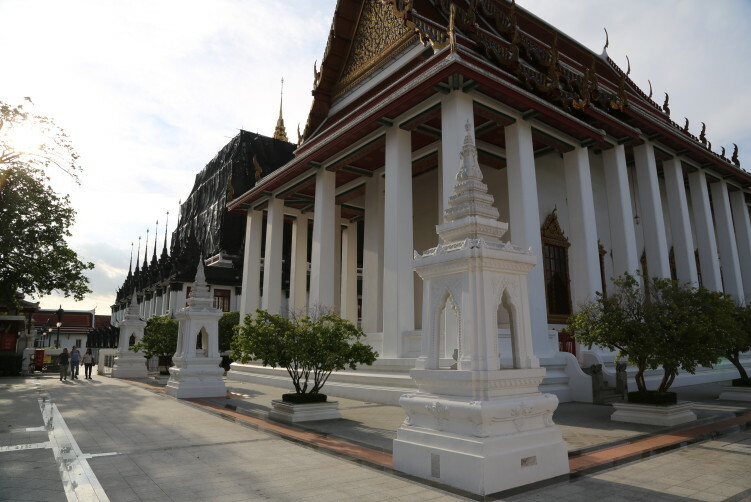 The temple is best known for the Loha Prasat (โลหะปราสาท), a multi-tiered structure 36 m high with 37 metal spires, representing the 37 virtues toward enlightenment. It’s the third Loha Prasada (brazen palace) in existence, and is inspired by two similar temples in India and Sri Lanka. Loha Prasat was at some point hidden behind an old movie theatre named Chaloem Thai, but the theatre was demolished in 1989 to improve the scenery along Ratchanatdaram Road. Bangkok doesn’t really miss majestic temples, but some of them really stand out with their unique architectural identity. Despite being quite near Khaosan Road and next to the well known Wat Saket, the superb Loha Prasat is not to often talked about. But it should be. In 2005, the temple was submitted to UNESCO for consideration as a future World Heritage Site, highlighting the historical importance of the temple. 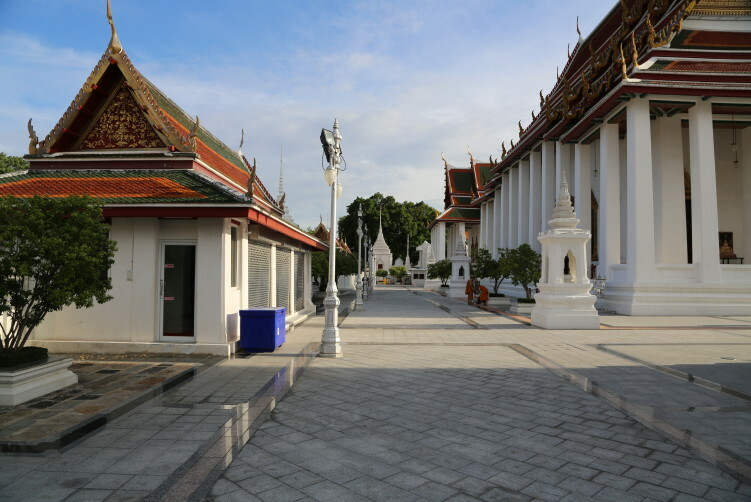 It’s located on the grounds of Wat Ratchanaddaram and is often referred to as the “Metal Case”. The temple is erected in a very unusual way with multiples concentric square levels built on geometrically aligned pillars. A relic of lord Buddha is kept at the highest level. 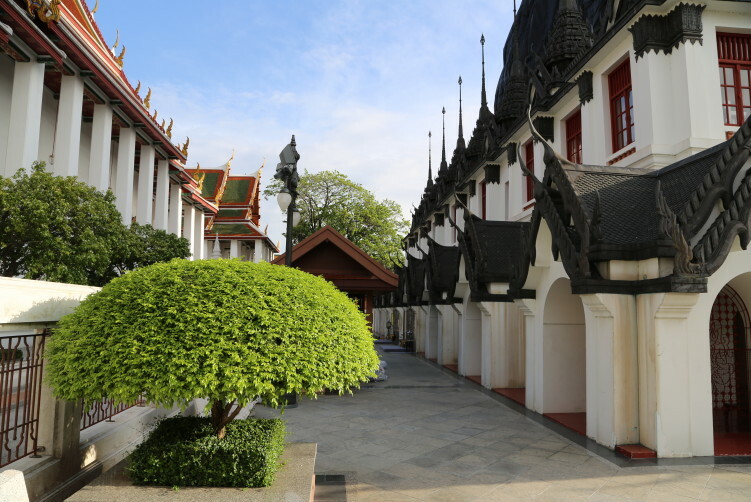 Loha Prasat is by the way the Indian name dating from the time of Buddha, and is referring to a multi-storey and square based construction with metal spires originally used as Monk’s quarters. The two temples in India and Sri Lanka is not existing anymore, so the one in Bangkok is the only one still standing. If being in the area, this is a visit to make. And there are plenty of reasons to be in the area. Both other temples and cultural sights, but also the lovely food you find in the neighborhood. It’s a 15 minute walk from Khao San road, located in between Wat Suthat and Wat Saket, so you can easily cover all three temples in one trip. A small 20 baht fee is requested to enter this beautiful maze and its spiral staircase. If nobody is there to collect the fee, please consider the 20 baht a donation as the money is used to keep everything in good condition. Also make sure you don’t miss out on the large white temples of Wat Ratchanatdaram that is surrounding Loha Prasat itself. This is were to admire the golden seated Buddha and the beautiful murals pairings and door carvings. Open: 8 am – 5 pm. 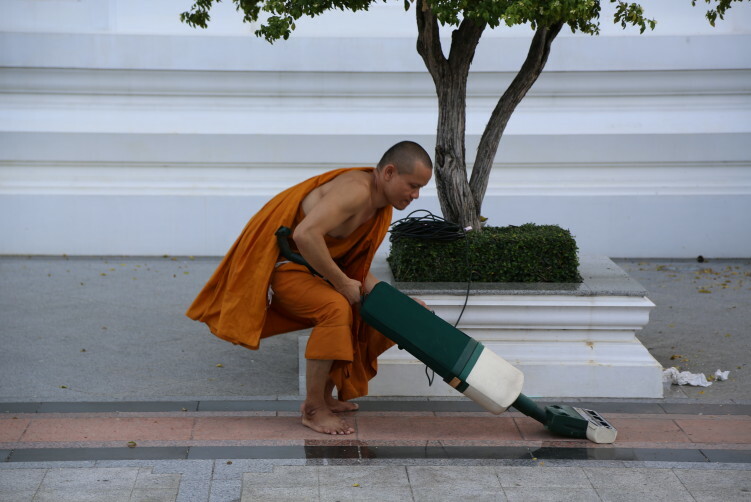 Be aware that Loha Prasat open 9 am. I just ate at this restaurant and it was not a good experience. The noodles were wrapped in a nasty fried egg (not what we ordered) and were dry and flavorless as was the over cooked shrimp. We waited for over a half an hour for a dish that takes minutes to prepare. People that came in after us were seated, ordered and served before we got our food. Sorry to hear that. I have never had any problems here, either with service or the food. The wrap version – I have mentioned that in another artickle of Thip Samai – is not a prefered choice as the noodles easily gets soggy and shrimps gets overcooked. Again sorry for your experience, because it really is one of the best spots in town for Pad Thai with fat from shrimps head.